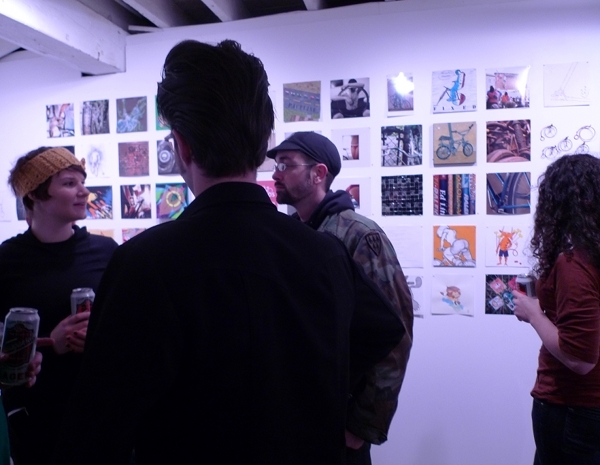 On Saturday night I stopped by the opening of Spoke Count, a group exhibition at the Chorus Gallery in Somerville Mass., which is affiliated with Open Bicycle. As someone who has both exhibited at and curated a fair number of shows, I thought it would be interesting to write an informal review of this one. Despite my friendly affiliation with Open, I believe that I can be objective, and I hope the organisers of the show will not take offense at anything expressed here. 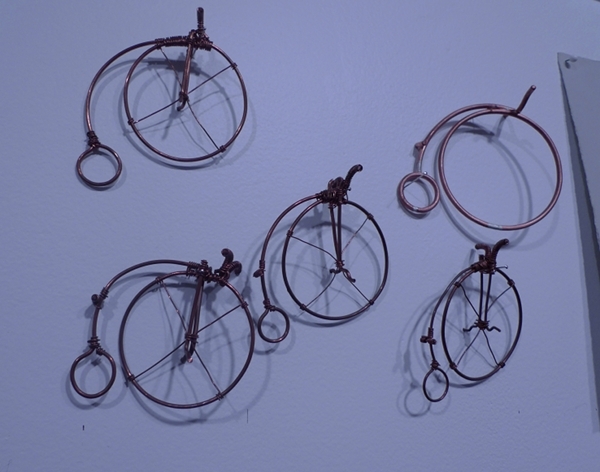 Spoke Count is a collaborative installation of over 100 small works about bicycles, submitted by local artists. Each piece is no greater than 8" in one direction and the work is arranged in a large grid along the gallery's main wall, in much the same manner as we are accustomed to seeing a set of "thumbnails" in a virtual image gallery. I felt that arranging the work in this way made an impact on several levels. In the most basic sense, it illustrated the sheer variety of possibilities when the concept of "bicycle" is evoked. 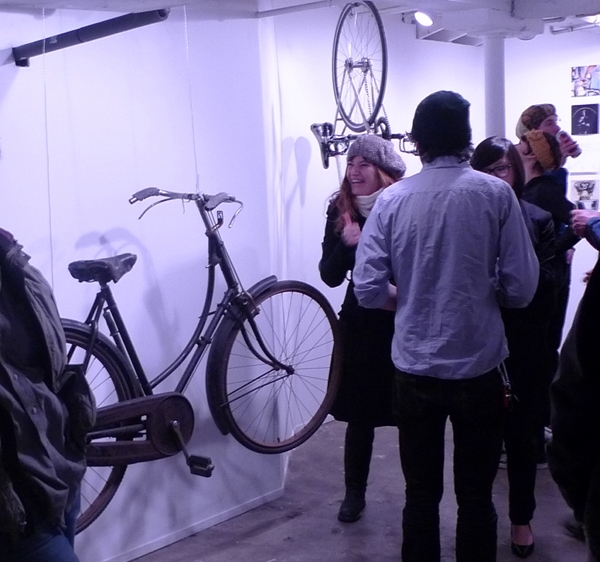 Submissions included images of vintage 3-speeds, slick track bikes, stately roadsters, and even penny farthings. 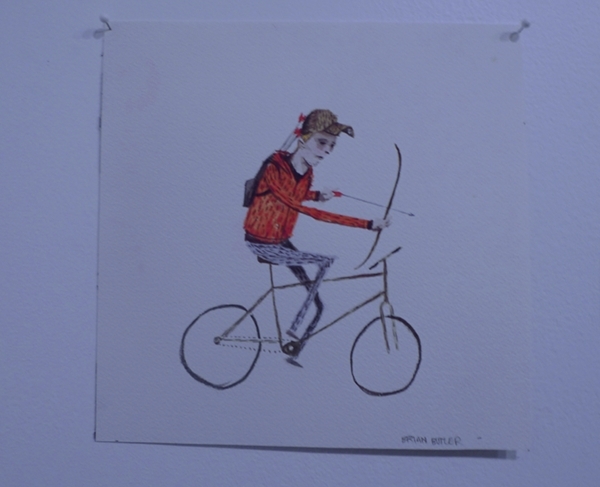 Additionally, it showed the variety of personalities of the people who ride bicycles. The type of artwork a person makes, the colours they choose, the themes they portray - all of this is information that gives the viewer a glimpse of the artist's inner world. There were many, many different inner worlds on display, rather than just some single stereotypical notion of "cyclist". Indeed it was refreshing that the exhibition was not dominated by glossy images of excruciatingly hip young people doing excruciatingly hip things with track bikes. It really was representative of the community at large. And the fact that all the pieces are the same size and priced equally, communicated the idea that everybody's vision of "bicycle" is equally valid, equally important, equally valuable. In addition to the grid of small works on the main wall, Spoke Count displays several bicycles that are of historical interest. These hang suspended from the ceiling, their gentle swaying evoking the comparison of cycling to the feeling of flying. Among the bicycles on display is my 1936 Raleigh Lady's Tourist (not for sale). All in all, I felt that Spoke Count is a successful exhibition both in terms of the way it is put together and in terms of what it communicates. 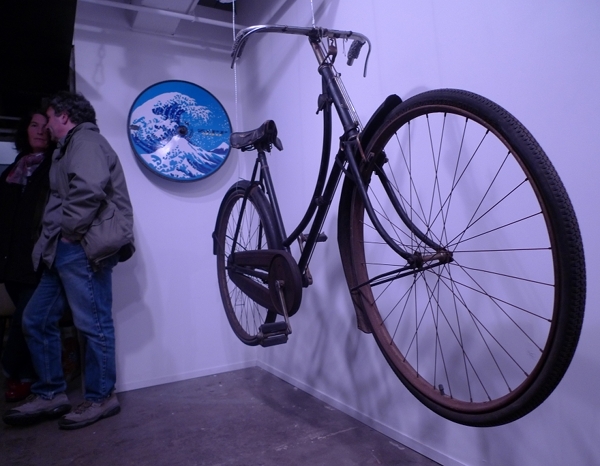 An additional question that is often asked in a themed show like this, is whether it stands on its own as an art exhibition per se, rather than just being a show for bicycle enthusiasts. For the most part, my answer to that would be "Yes". Joshua Kampa knows what he is doing when it comes to aesthetics and critical theory. And in terms of relevance, Spoke Count succeeds as a meditation on a significant social change that is currently taking place in the community. It is a small, cozy show that does not attempt any grand gestures. And yet it sends a strong, personal message. 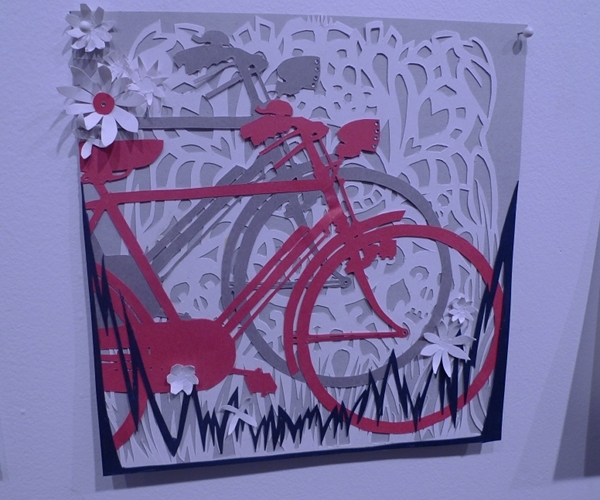 In general, I would describe the Chorus Gallery not as a place that exhibits "bicycle themed art", but as a gallery featuring a diverse selection of young local artists whose work is occasionally related to the theme of bicycles or self-propelled movement. Having said that, one thing I believe would help the gallery affirm itself as a community art space, is making an effort to reach out to a more diverse audience. The openings at Chorus are always exceptionally well attended. But in some previous ones I have been to, there was a feeling that all the attendees knew each other and that the event was more of a party than an art opening. And while such an atmosphere is fun and full of energy, it can feel alienating to visitors who have come to see the art and are not part of "the scene". At Spoke Count, I noted a more diverse group of visitors than at previous openings, and I hope this trend continues. As a community art space in Union Square in Somerville, the Chorus Gallery has tremendous potential and I am looking forward to its future shows. Nice. I've been longing for my old world of late. 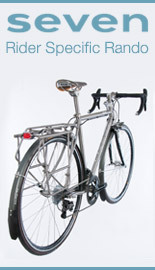 Me thinks you and I have more in common than a Pashley... Aesthetically, I am well pleased ~ thanks. Wow, you used "curated" to discuss art! I don't think that word has been appropriately employed on blogs in at least six months. Good job restoring it to its proper place. Is this a common approach to shows? I really like the idea. Ironic that my favorite was the one with the least bicycle content - the face peering out from the chainwheel. Sigrid - Thanks. 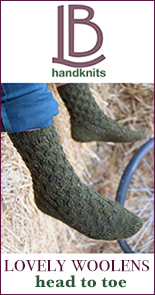 Looking at your site I often get the same feeling re common interests. Jefe - Tee hee. I am subversively reclaiming the Artiste's vocabulary. Steve - What do you mean, the group format? Or something different? Looks like a fun and diverse exhibition. Themed exhibitions can work well providing there is a diversity of artists in terms of age, outlook and medium; so there's something for everyone to get excited about. Nice to see your Raleigh getting an outing too :-)) - I bet it caused a few comments! The group format, with all the art the same size, is wonderful. The exhibit looks wonderful, and I certainly share your sentiment about the fortune that there is not a lot of glossy images of excruciatingly hip young people doing excruciatingly hip things. I had only originally heard about it from you a little while back, so I am sorry that I did not have an opportunity to produce something for the exhibit... I will make an opportunity to get over there and at least see it. "But in some previous ones I have been to, there was a feeling that all the attendees knew each other and that the event was more of a party than an art opening. And while such an atmosphere is fun and full of energy, it can feel alienating to visitors who have come to see the art and are not part of "the scene". At Spoke Count, I noted a more diverse group of visitors than at previous openings, and I hope this trend continues." "... my 1936 Raleigh Lady's Tourist.."
Nice to see your 'Lady' gracing the occasion. Wow, very cool concept. Would have liked to see that. Luc - I didn't submit any work either. I find it impossible to make something in accordance with a specific theme. If I already have work that would fit into the theme, then I can submit it, but not otherwise. I would make a terrible commissions painter! 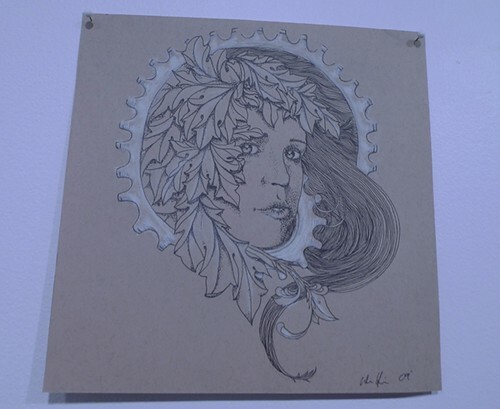 The rub being that I have been conceiving a bike related piece for years now; but as much as I love cycling and my art, I can't really resolve how to marry the 2, and I am not really sure that I need to. Portraits are the only things I have ever done on commission... as far as themes go, they are relatively singular. i liked your review of the opening, especially as you touched upon the social aspect of such events. i've made the same observation at openings of this sort (not necessarily bike-oriented exhibits, but any that are associated with a specific culture), and i agree that it can be alienating. on the other hand, by combining an art gallery with a bike shop, one is, by design, biasing the target audience away from diversity, and enriching for a pre-selected, narrower group. 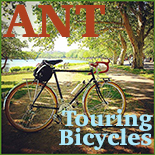 i don't really know what can be done to "reach out" for a more diverse audience unless the connection (whatever it may be: physical, thematic, whatever) between the art and the bicycle shop is severed. i think the connection as it stands will be a persistent obstacle to the goal of affirming the space as a true community art space. hopefully i'm wrong, but that's my cynical perspective. i stopped by the other day to see the exhibit-- it was quite enjoyable. somervillain - you make a good point, but I do think the Chorus Gallery can stand on its own. It is a professional and useable space, the likes of which I had not seen in other galleries that are attached to boutiques. Usually a boutique "gallery" tends to be sort of mixed in with the boutique itself, and artwork is hung above or next to the goods that the shop is trying to sell. The Chorus Gallery is a separate space, roomy and professionally lit. The only thing it shares with Open is a door and the bit of floor space you need to walk through in order to get to the gallery. During the openings, I've noticed that they clear out the floor space of the shop entirely, so that if you do wander out of the gallery and into the shop, you feel that it is an extension of the gallery rather than the other way around. Also, you do not at all feel that the opening is an excuse to sell you goods from the shop, as there simply are none on display even in the shop itself. To me, this gesture alone has a great deal of significance. 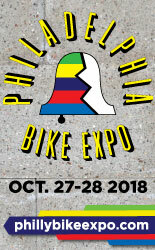 As for attracting a more diverse audience, I do think there are things they can do - like send press releases to various non-bike related local blogs and other media outlets. 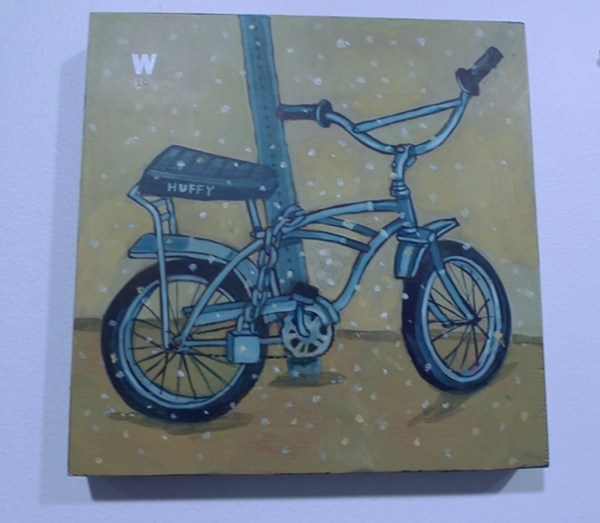 Some of their shows are not about bikes at all (the previous one was all figurative paintings), and people are always looking to get out and visit galleries in the community. 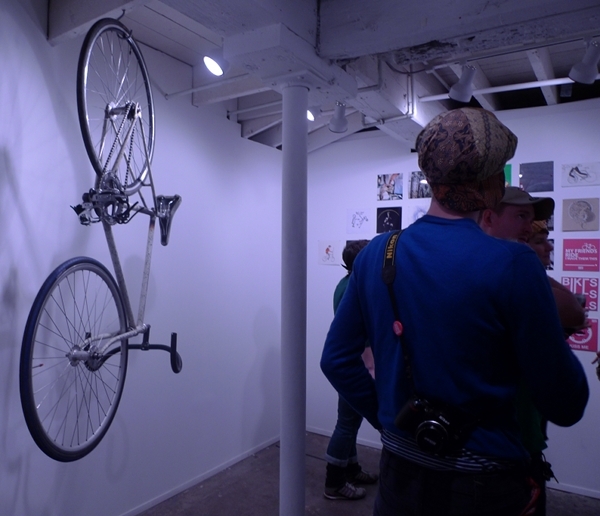 Your bicycle looks great hanging as "art". Cool! Love this bicycle art. Really fascinated with hanging dutch bicycles for some reason.